WATCH Disney Junior is the free official Disney Junior app for Windows 8 and 8.1. The app has been created by Disney itself, and the app allows you to watch full-length episodes of their shows on your device for absolutely free. The app has a great collection of shows, and weighs in at just about 14 MB. The app makes for a great download on any device as it’s completely free to be downloaded and installed, supports touch input and has cute overall graphics all around. 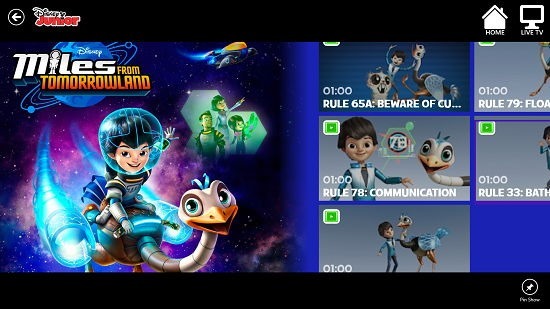 As a bonus, the app also allows you to sign in with your cable TV provider’s account (works only in the United States) so that you can sync up with their live stream of episodes. If you are outside the US, you can still watch previous full-length episodes for absolutely free on the app! 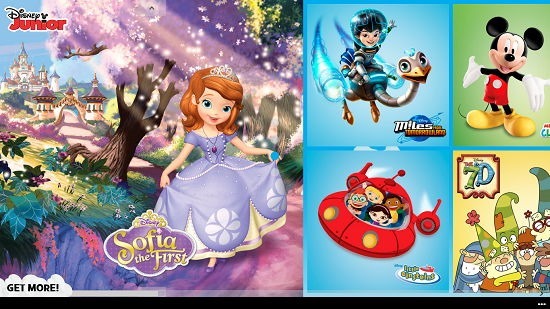 WATCH Disney Junior is available for free from the Windows App Store. The app when launched will present you with a very magical and kid-friendly interface as can be seen below. You can scroll to the right to see more shows or you can scroll to the bottom in the big sized image at the left by flicking it upwards. You can do this on mouse only devices by clicking and dragging on the image upwards, or you can accomplish this on touch devices by simple flick of your finger. The big-sized images are the featured shows. 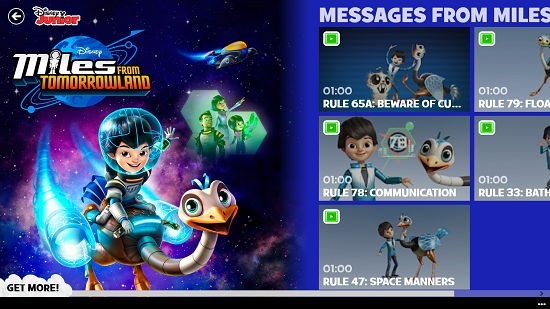 You can scroll to the right and see more shows, and also can see the timings for what shows stream live in the next few hours on television, basically giving you a schedule of the shows for the Disney Junior Channel as well (see screenshot below). 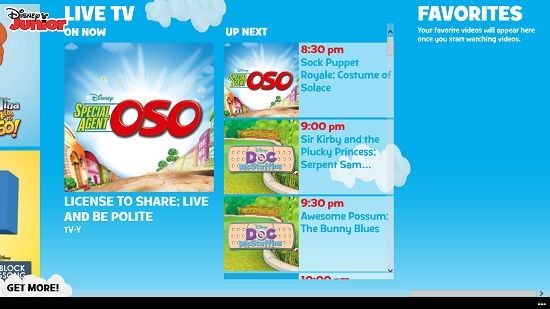 When you click on a show’s tile, you will be presented with its show tiles, as can be seen below. You can then click on a show to open up the standard video player interface where the show will be buffered from an online source. You can also right click on a show tile to pin the show to your start screen, go back to the main screen etc. via the control bars which are revealed from the top and bottom of the screen when you perform this gesture. This basically concludes the main features of this app in a nutshell. WATCH Disney Junior is a great app for kids to watch Disney Junior shows at ease on your Windows 8 device. Your kids will definitely love it!